India’s Polar Satellite Launch Vehicle is set for liftoff Friday with five satellites built in Britain to look down on Earth and test a solar sail’s ability to clean up space junk. The PSLV is counting down for launch at 1628 GMT (12:28 p.m. EDT) Friday from the Satish Dhawan Space Center on India’s east coast, where liftoff is timed for 9:58 p.m. local time. India’s workhorse launcher, first developed more than 20 years ago, will make its 30th flight Friday, aiming to delivery its five satellite payloads to an orbit 647 kilometers — 402 miles — above Earth. Three Earth observing satellites made by Surrey Satellite Technology Ltd., or SSTL, are the main passengers on Friday’s launch. The spacecraft are the fruits of a 2011 deal inked between Chinese and UK companies worth approximately $170 million to provide high-resolution satellite imagery of China’s growing cities. The trio of satellites are part of the so-called DMC3 constellation, and together the three platforms can image the same place on Earth daily, according to SSTL officials. The DMC3 satellites were manufactured under contract to DMC International Imaging, or DMCii, a subsidiary of SSTL. DMCii coordinates a network of Earth observation satellites owned operators based in the UK, China, Spain and Nigeria for commercial imagery sales and humanitarian emergencies. The acronym DMC stands for Disaster Monitoring Constellation, and DMCii is based in Guildford, near SSTL’s headquarters. DMCii ordered the three new satellites after it struck a deal with Beijing-based 21AT, which sells imagery to the Chinese government to monitor urban growth, land and water resources, pollution and natural disasters. Under the terms of the agreement, 21AT is leasing 100 percent of the imaging capacity of the three DMC3 satellites over their seven-year design lifetimes, while DMCii will own and operate the spacecraft. Officials said the structure of the deal gives 21AT access to high-resolution imagery without the complexity of flying its own satellites. Each DMC3 spacecraft weighs 447 kilograms, or 985 pounds, at liftoff and uses an electric xenon-fueled propulsion system for attitude control and orbital maneuvers. Once the satellites are in space, ground controllers will spread the spacecraft 120 degrees apart along a single orbital plane. Together, the satellites will observe up to a million square kilometers — nearly 400,000 square miles — per day by pointing up to 45 degrees off their ground tracks to image targets, SSTL officials said. The satellites carry electro-optical cameras with one-meter (3.3-foot) resolution in black-and-white mode, the highest-resolution Earth observing spacecraft ever built by SSTL. 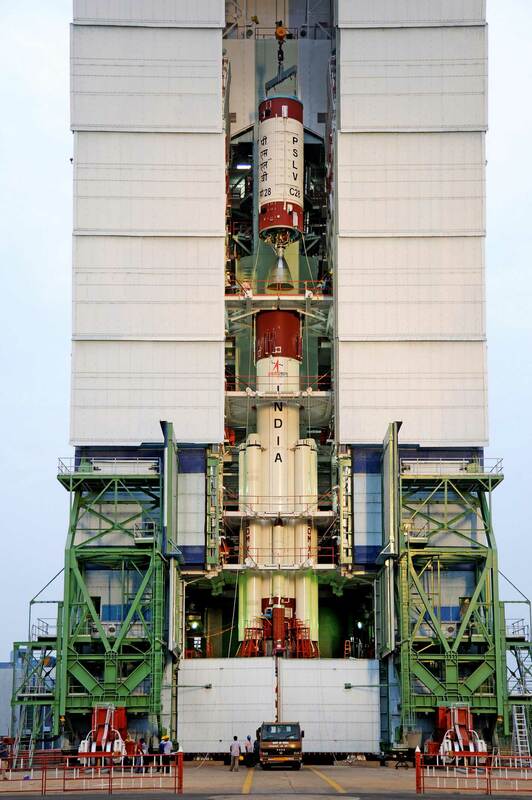 Another SSTL spacecraft, known only by the acronym CBNT-1, is also mounted aboard the PSLV rocket for Friday’s launch. According to a press kit released by the Indian Space Research Organization, CBNT-1 weighs 91 kilograms — 200 pounds — and will test Earth imaging technologies. Photos posted on ISRO’s website show CBNT-1 as a cube-shaped spacecraft. A small shoebox-sized CubeSat named DeorbitSail is the fifth UK-made spacecraft on Friday’s PSLV flight. Funded through a grant by the European Commission, DeorbitSail is packed with four Kapton solar sail membranes that will deploy once the satellite is in orbit to cover an area of up to 16 square meters, or 172 square feet. The DeorbitSail project is led by the Surrey Space Center at the University of Surrey, and its goal is to prove solar sails can hasten a satellite’s descent from orbit by creating drag from solar light pressure. Proponents of solar sail technology often point to it as a way to explore the solar system by using solar photons, or light particles, to propel spacecraft to tremendous speeds. The same technique could pull old satellites from space back into the atmosphere, helping rid orbital pathways of space debris. Officials expect it will take about six months for the CubeSat’s solar sail to bring DeorbitSail into the atmosphere for a destructive re-entry. ISRO’s launch press kit says the five satellites weight 1,440 kilograms, or 3,174 pounds, making the payload the heaviest commercial package ever sent into orbit by PSLV. DMCii booked the PSLV launch with Antrix Corp., the government-owned commercial sales arm of ISRO. Friday’s flight will be the ninth launch of a souped-up version of the PSLV with six enlarged strap-on solid rocket boosters. The 14-story rocket will blast off with a peak power of 2 million pounds of thrust and initially turn southeast, then veer south in a safety measure to keep from flying over Sri Lanka. T+plus 0: The PSLV’s solid-fueled first stage ignites, followed less than one second later by ignition of four of the rocket’s six solid rocket boosters. T+plus 25 seconds: The PSLV’s other two solid rocket boosters ignite at an altitude of 2,680 meters, or nearly 8,800 feet. T+plus 1 minute, 10 seconds: The PSLV’s four ground-lit solid rocket boosters burn out and jettison in pairs. T+plus 1 minute, 32 seconds: The PSLV’s two air-lit solid rocket boosters burn out and jettison at an altitude of 47 kilometers, or about 155,000 feet. T+plus 1 minute, 50 seconds: The PSLV’s first stage burns out and jettisons, and the hydrazine-fueled Vikas second stage engine fires. T+plus 1 minute, 55 seconds: The PSLV initiates closed loop guidance. T+plus 2 minutes, 34 seconds: The 3.2-meter, or 10.5-foot, diameter aluminum payload fairing jettisons once the PSLV flys above the dense lower atmosphere. T+plus 4 minutes, 22 seconds: The PSLV’s Vikas engine shuts down and the second stage separates at the conclusion of its burn at an altitude of 231 kilometers, or about 144 miles. T+plus 4 minutes, 23 seconds: The PSLV’s third stage solid-fueled motor begins a 112-second burn. T+plus 6 minutes, 15 seconds: The PSLV’s third stage motor burns out, and the rocket begins a coast phase. T+plus 8 minutes, 37 seconds: The PSLV’s third stage separates from the fourth stage. T+plus 8 minutes, 47 seconds: The PSLV’s fourth stage, powered by two hydrazine-fueled engines, ignites to propel the DMC3, CBNT-1 and DeorbitSail spacecraft into orbit. T+plus 17 minutes, 19 seconds: The fourth stage shuts down after achieving a circular target orbit with an altitude of 647 kilometers, or 402 miles, and an inclination of 98.06 degrees. T+plus 17 minutes, 57 seconds: The three 447-kilogram (985-pound) DMC3 satellites deploy from the PSLV’s multi-payload adapter. T+plus 18 minutes, 36 seconds: The experimental DeorbitSail CubeSat is released from its canister atop the PSLV’s fourth stage. T+plus 19 minutes, 16 seconds: The 91-kilogram (200-pound) CBNT-1 Earth observation technology demonstration satellite separates from the PSLV.